Heaven Comes to Earth is a compilation of songs of comfort and joy that can be enjoyed all year long! Choral singing by boys and men is a venerable tradition dating back centuries. Though once common in Anglican churches across the world, such choirs are now a rarity beyond the cathedrals and collegiate chapels of England. In America, only a handful of churches maintain this tradition, which makes the vibrancy of the Grand Rapids Choir of Men and Boys simply astonishing. Here is a superb choir of talented, passionately devoted boys and men singing at an artistic level to rival any choir anywhere. Though they claim no ecclesiastical affiliation, under the leadership of Scott Bosscher, their Music Director, they strive to perfect God's praises by offering the finest sacred music, sublimely sung. This magnificent musical ensemble would be the pride of any city. What they contribute to the cultural landscape of Western Michigan is beyond measure. It was my joy and privilege to conduct these hard-working, gifted musicians in this recording. May their music be a source of comfort and joy to all who hear them sing. International Shipping - after check out and we will send an invoice for shipping & handling. Live at 25! represents the culmination of a quarter century of the Grand Rapids Choir of Men & Boys singing and serving here in our West Michigan community. If asked what this accomplishment means in a city whose tapestry of the arts is rich and varied, the answer would be that the Choir of Men & Boys fills a unique and important role in feeding the musical and spiritual soul of our city, and that they do it in a way unlike anyone else. 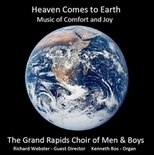 This rich musical library is the well from which the Grand Rapids Choir of Men & Boys draws its inspiration. All of the selections on this CD were chosen from live performances sung by the choir throughout its 24th season (2013-14). This collection represents the breadth of both themes and music offered each year by GRCMB to our community: Music for Royal Occasions, Christmas Lessons & Carols, Lenten Meditations and finally Choral Evensong. Recording live also presents the choir as the community hears it, close and personal with the excitement of the boys giving it their very best to get it right with only one take, as well as the live concert experience of an occasional squeak of a church pew. 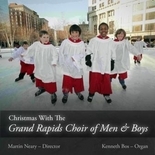 “Christmas with the Grand Rapids Choir of Men & Boys”. has become a local holiday favorite, We currently have no copies in stock. Here is what director Dr. Martin Neary has to say about this project. “I can tell you that there are some splendid surprises in this collection, ranging from the peace of Away in a manger and Silent Night to the racy settings of Ding! Dong! Merrily on High and John Rutter’s Twelve Days of Christmas; so relax to the sound of the tambourines as well as to the beauty of the choir’s singing, and marvel at the inexhaustible source of inspiration the texts have given and continue to give composers.